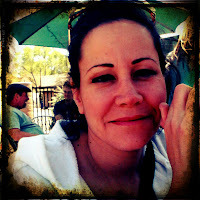 Gosh, I love my wife. And not just because she's beautiful and funny and a great mother and a talented professional. My wife is also super lucky. And it is this fact, frankly, that makes her extra-super-easy to love. She is always winning things: caller-number-x prizes on the radio, auctions, pull-a-ticket-from-a-tub drawings, things like that. It's a little uncanny. But it's also fun. Because, by virtue of our marriage, I get to hang around with her. And it's always fun to hang with a winner. In spring 2007 Rivendell Bicycle Works ran an article in issue #39 of their quarterly newsletter, The Rivendell Reader, about the Surly Pugsley, which, at the time, was basically a brand-new kind of production-bike, designed to be ridden over rough terrain and in sand and snow. 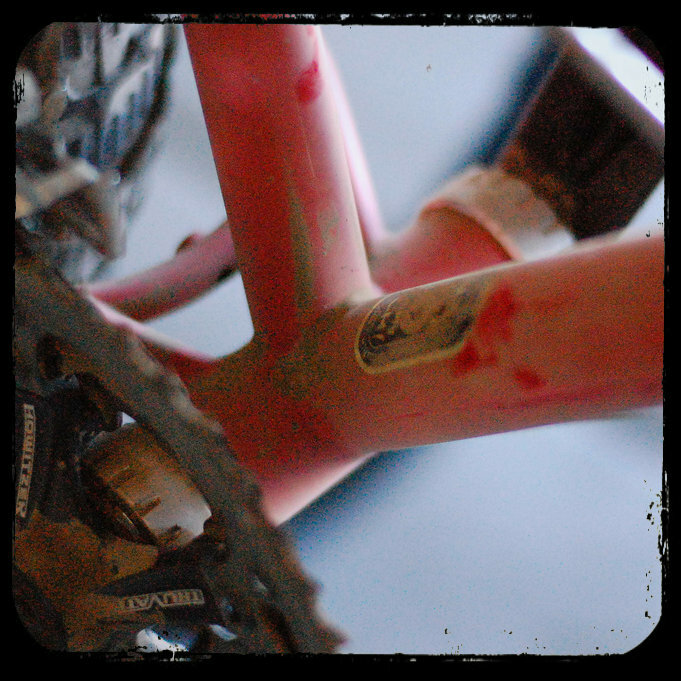 At that point in my life, I had worked for probably 10 of my summer "vacations" at a local bike shop and had, over the course of that time, through the shop's generous employee-purchase program, already bought two other Surly bikes, a Cross-Check and a Steamroller. I am very fond of both of these somewhat unusual bikes and, even from the beginning, have always felt a real philosophical kinship with Surly's whole "thing," which is a lot like Rivendell's in a sense: quirky, utilitarian, and unperturbed by (if not openly defiant of) market-trends... but on a budget that's a bit more my speed. Plus, as a gatherer and rider of many other odd bikes, each with its own very definite and discrete purpose, the Pugsley immediately made total sense to me. Needless to say, I wanted a Pugsley from the get-go. But, my fiscal bottom line at the time, and during the ensuing six years for that matter, made purchasing the not-so-cheap Pugsley impossible. In fact, lately, I'd sorta come to the conclusion that a Pugsley and I were never meant to be together, despite my self-identified status as an ardent "follower" of all things Surly. I browse around on Craigslist now and then, whenever the mood strikes, maybe a couple of times a month, usually looking at just two major categories which I find interesting: cameras (specifically looking at Nikon/Nikkor lenses) and bikes (non-specifically looking at anything that sounds old-and-interesting). I almost never find anything worth making an offer on, and I even less frequently buy. But I like to look once in a while, just to see what's out there... to me, it's a lot like the online version of driving around to garage sales just because you're up early on Saturday morning. About two weeks ago I was on Flagstaff-Sedona Craigslist late one night, when my wife walked into the room. "What are you looking at?" she asked. "Craigs," I told her. "Bikes, mostly." "Oh, yeah? Have you searched for "Pugsley" yet?" "What? No." I told her, somewhat incredulously. "There won't be a Pugsley on Flagstaff Craigslist! 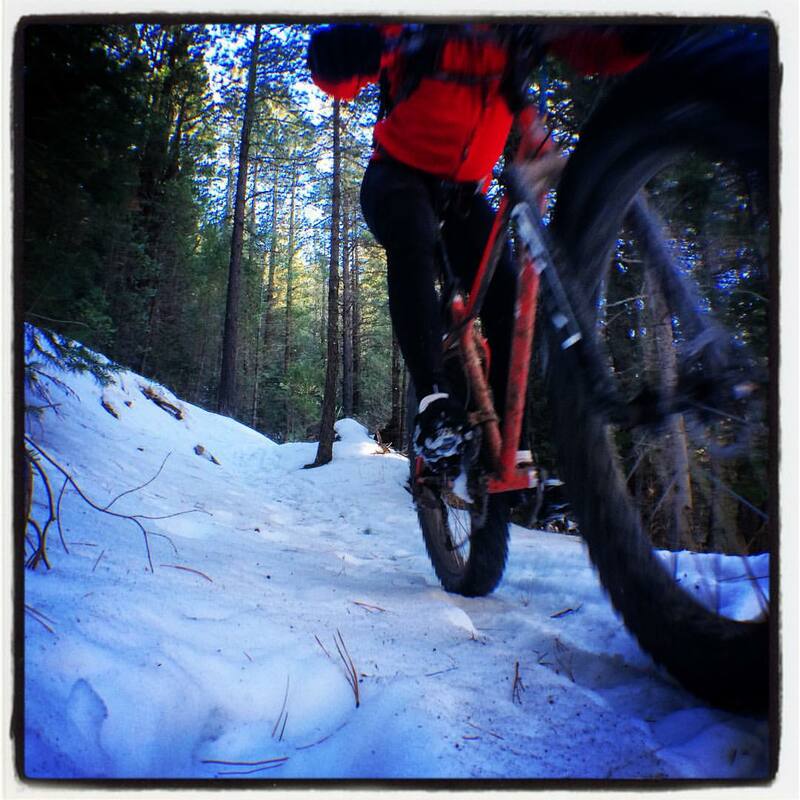 I've maybe seen, like, one fat-bike on our Craigs. Ever." "Well? Maybe there will be one tonight. Why don't you check?" So I did. 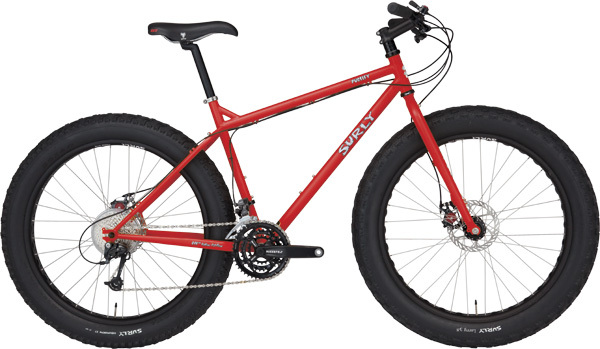 And there it was: Surly Pugley $900 (Greer). Bam. See how lucky she is? But, again, somewhat incredulously, I observed, "Seriously. Only nine-hundred bucks? For a Pugsley?! It must be thrashed." But, after clicking on the listing, and looking at the seller's pictures of the bike, it became very apparent that it was not. Not at all. In fact it looked to be in near-mint condition. I quickly sent an email to the seller: "What size is the Pugsley?" And waited impatiently for a response, which did not come until the next morning. "John-it's an 18" frame. Mike." Mike and I haggled a little bit via email over the course of the day. Not so much about price as about logistics. You see, Greer is a long way away from Flagstaff, a little over four hours driving. In the end we agreed to meet half-way, in the little town of Holbrook, in the parking lot of the local Taco Bell, and for that he agreed to drop his price to $850. My family and I drove over to Holbrook early the next day and arrived a couple minutes early. Mike, a friendly-looking older guy, was already there with the bike strapped carefully to a rack on the back of his truck. It looked even cleaner in person than it had looked in the ad online. A quick inspection and a spin around the empty parking lot. A brief exchange of cash. I loaded the bike on to the rack on the back of my van and we were off to the donut shop to celebrate! There is a lot to love about this bike. And a little to get used to. And pretty much next to nothing too-terribly-bad about it. In fact, it's really an unmitigated hoot to ride and perhaps should get the award for being the most just-plain-fun bike to ride that I've ever ridden. Ever. And that's sayin' something. 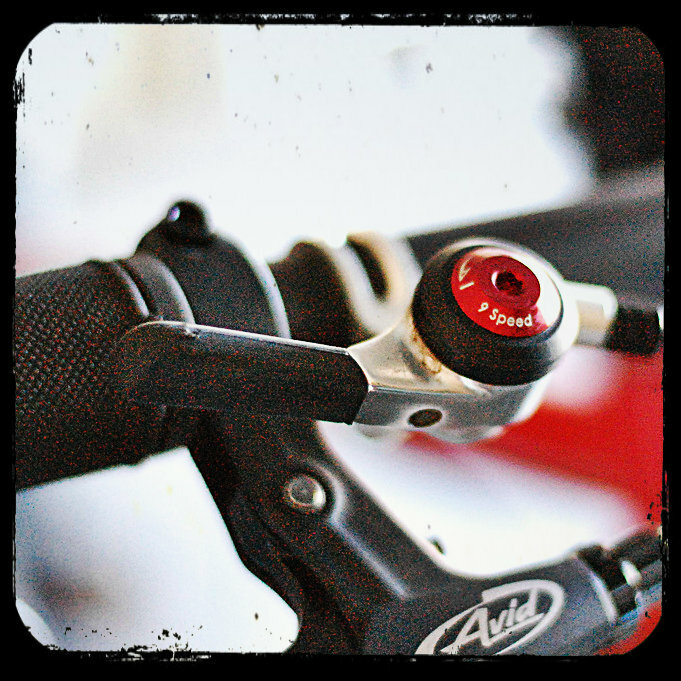 The stock spec on the Pugsley is super-impressive, most especially the Avid BB7 mechanical disc brakes and Microshift top-mounted thumb shifters. Both of these simple pieces of equipment do exactly what they are intended to do without unnecessary complication and without fail every time. 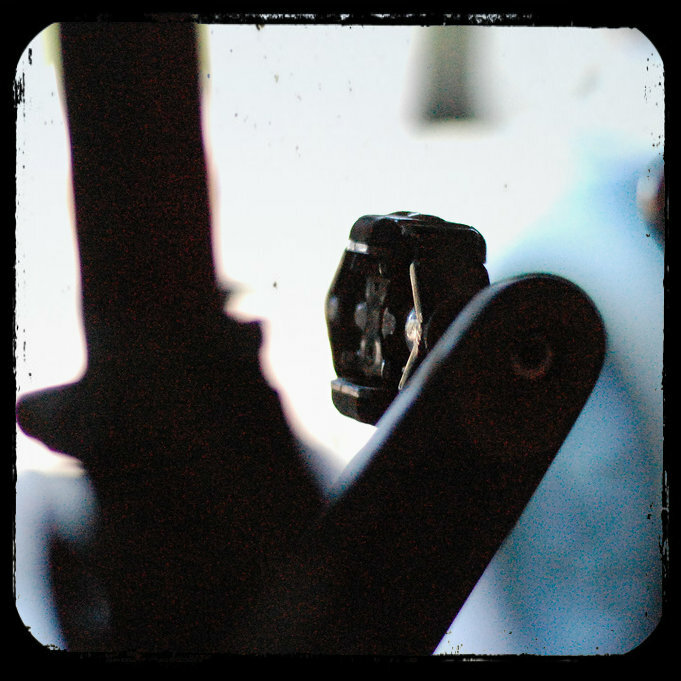 They're sensible, functional, and field-serviceable, and, the shifters anyway, are darn good-looking, as well. I'm so impressed with these components that I've ordered another set of both to replace the unequivocally disappointing, frustrating, and prone-to-fade/fail-at-the-worst-possible-moment Avid Elixir hydraulic brakes and needlessly noisy Sram X7 clicky-shifters on my fancy Specialized Epic 29er. In addition to the very square deal Mike gave me, price-wise, for what I had assumed would be a bone-stock Pugsley, Mike had also made a couple of nice upgrades to the bike as well, installing a sweet Surly rear rack and spendy kevlar-beaded, 120-tpi Larry 3.8" and Endomorph 3.7" tires front and rear. Very cool. I've made just a couple small changes myself to the bike in the first two weeks I've owned it. I had a little problem with the stock black-anno Kalloy seatpost slipping a bit on each ride, so I switched it out to a less-fancy brushed-silver one, which, along with a good greasing of bolt, collar, and post, has solved that problem nicely. Likewise, I put a Specialized Phenom saddle on it, and removed the stock flat pedals and replaced them with an old set of Onza pedals, which are both always my saddle- and pedal-of-choice. And I don't care what you think of that. Getting used to the Q-factor created by the 100mm bottom bracket shell has taken some time, but mostly because it makes coercing the bike through otherwise passable-but-narrow gaps between rocks and logs really challenging in a new, sorta scrape-and-grind kind of way. 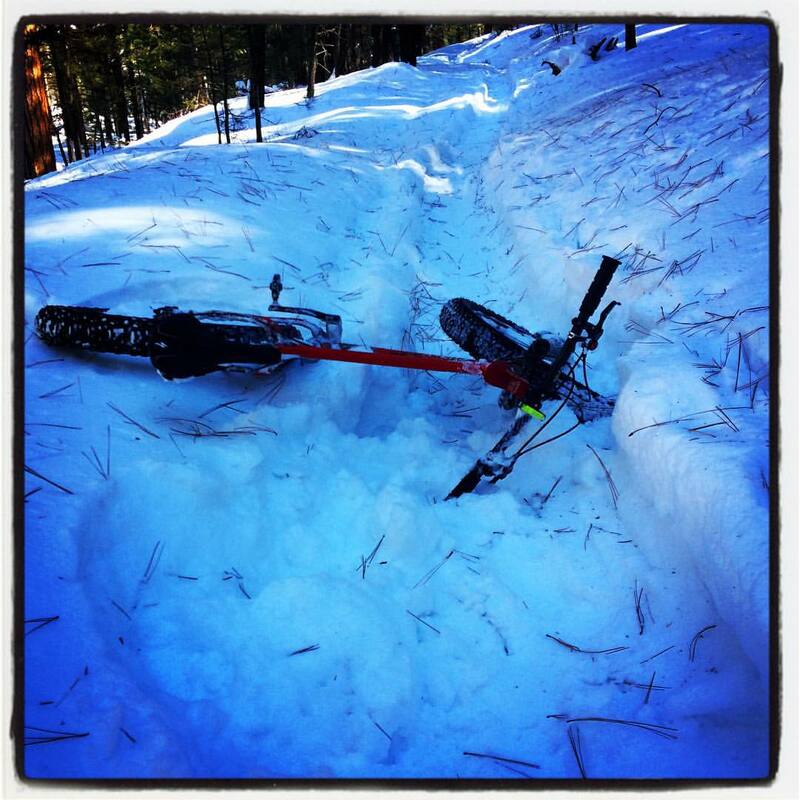 The 17-degree sweep of the Salsa MotoAce handlebars also took a little getting used to, too. And, albeit more mentally than physically, it's been a little hard to get my head around riding a bike that tips the scales at nearly 37.5 pounds. Nevertheless, the bike handles in a far less-cumbersome way than I anticipated, when both climbing and descending... just as the old Rivendell article implied it would. It feels a lot more like a "normal" bike than I expected it to, especially at speed, when it jumps on to a set of invisible rails and simply charges down swoopy singletrack, feeling a lot more like a moto than a bicycle. When climbing, it's best to just sit-in and spin upward. With the tire pressure set at about 10psi, the bike will ascend just about anything you can stay seated for, no matter how dusty and loose. The Endomorph is a decent climbing tire, although it's stopping power at-speed leaves more than a little to be desired. 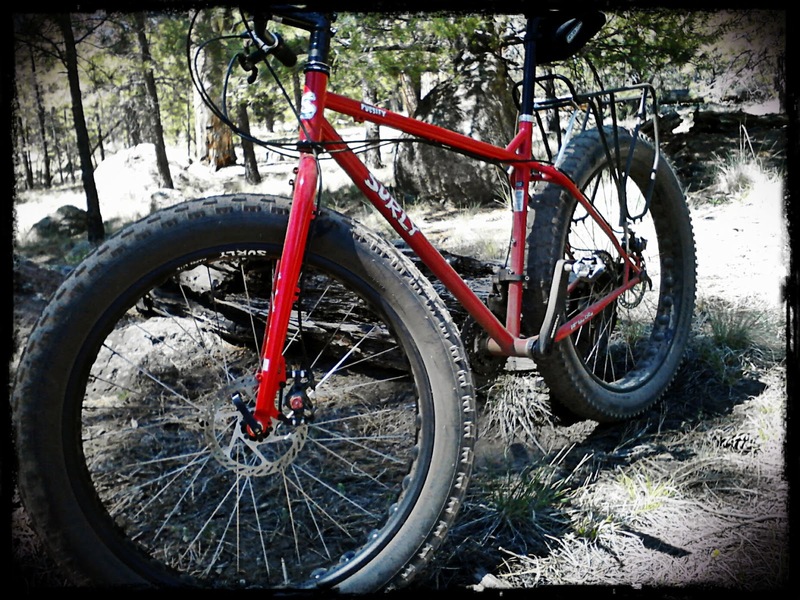 In dry sand, as well as in our local, seasonal six-inch-deep June-moondust, the bike really shines, mitigating both trail-factors to the point of zero, essentially causing them to disappear beneath the tires' massive girth. On humpy rocky techy trails at slow speed it's super cush and the fat tires inspire new-found confidence and capability at every turn. 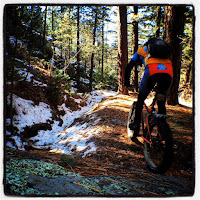 When cruising down this same kind of trail, the bike handles heroically, like almost any other 26" wheeled bike, counter-steering well into loose quick turns, railing in the chicanes, and hopping surprisingly deftly, despite it's heft, over minor obstructions. 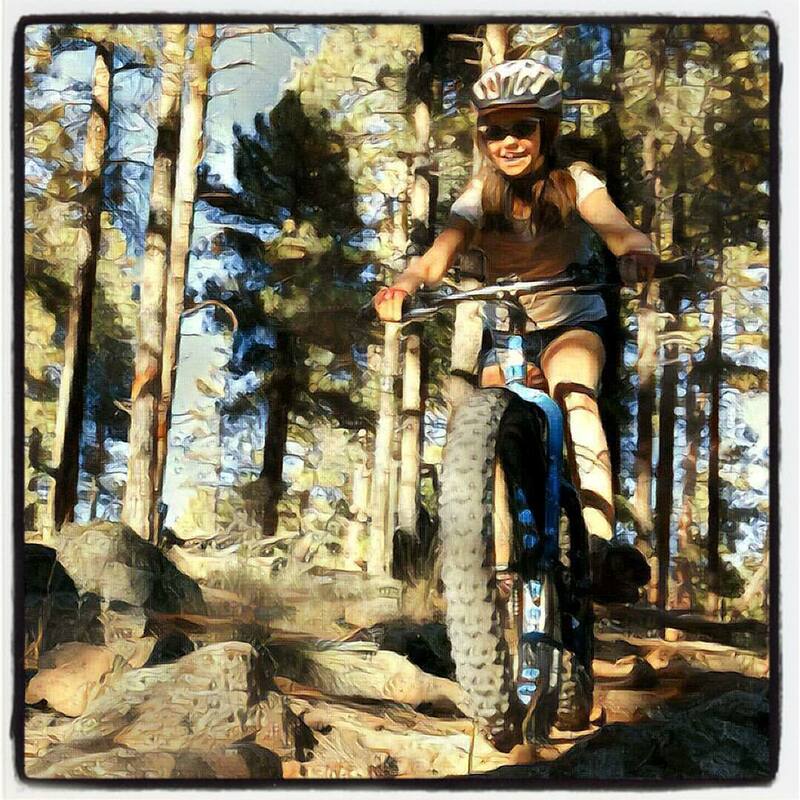 But, be advised: the Pugsley can get a little squirrelly at speed in the rocky-techy stuff if you allow the big soft tires to start bouncing around. 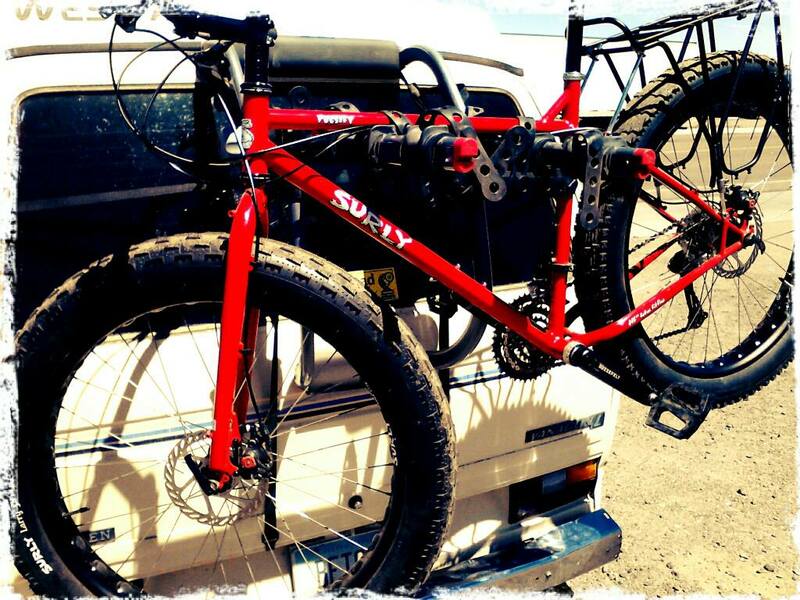 Bottom-line: I am thrilled with my new Surly Pugsley! While not without its quirks, it's easily an all-around win in my book. 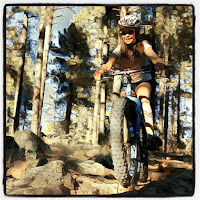 Download scanned pdfs of the article Pugsley by Surly from Rivendell Reader #39 here. Well, the Endomorph and the Larry didn't last long. After just a couple months riding my "new" Pugsley back in 2013 they were quickly replaced with a Nate and a Knard, both far superior tires for real riding around here, especially by comparison. 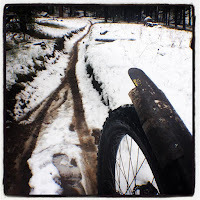 The Endomorph was, in truth, a mostly terrible tire in nearly all conditions, and the Larry wasn't much better, being among the sketchiest front tires I've ever ridden, most notably in snow where it often wandered this way or that without warning, as if it really did have a mind of its own. 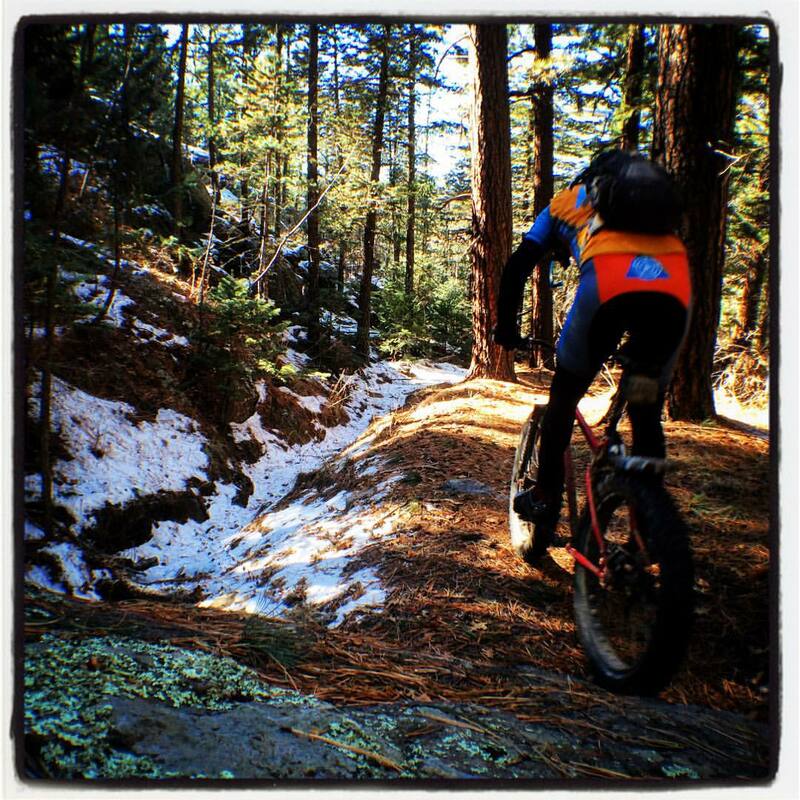 The Nate and the Knard on the other hand are both exceptionally trail-worthy tires and, having ridden them for the last couple-three years, in all four seasons, and every condition imaginable, I feel confident in recommending them. For what it's worth, the Endomorph is now mounted on my Dirtuni mountain unicycle, where it excels as a high volume, low pressure wheel for this super capable rig. The Larry should be in the trash, but it's not. It's hanging from the ceiling in the garage with all the other back-stock take-off tires that I will probably never use. The hefty, stock Pugsley fork has been replace with a carbon Fatback fork, which saved a few ounces, maybe pounds, but required waaay to much effort to upgrade, something I should have paid attention to before making the deal to buy this fancy fork from a friend. Had to re-lace the entire front wheel because the Fatback is non-offset. And had to spacer the front brake rotor because the brake bosses on the Fatback are for front-standard brake mounts and the Surly wheels are using rear hubs, a difference of about 2-3mm. Fortunately, presta washers are exactly the spacing I needed to get everything to work so I mounted one of them behind each bolt in the rotor and voila. Works like a charm. 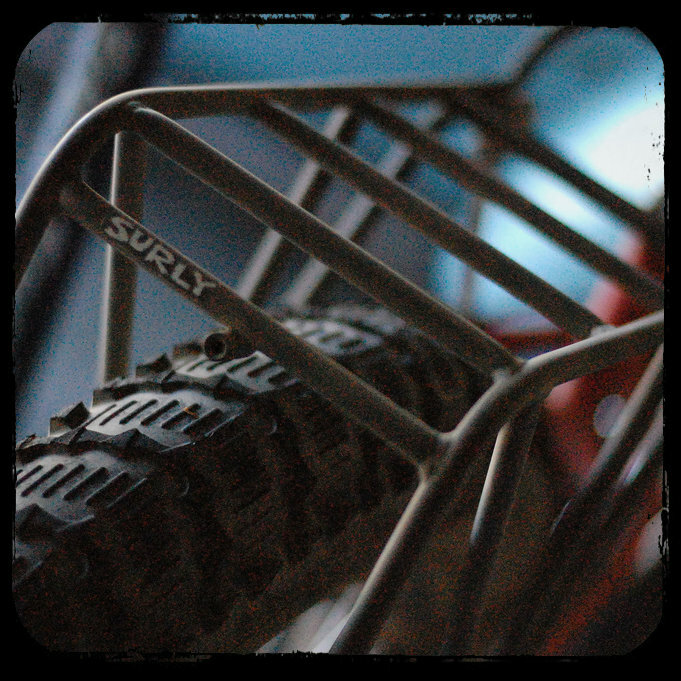 The Surly rack has mostly been unmounted for three years. Not for any other reason than I've had little need to mount it. It's a lovely rack, beefy and well made, but I haven't needed to carry much on my rides the last three years that I haven't been able to carry on my back. And the rack as-is is not much good as a fender. I cut up an old waterbottle and modded my own fatbike fender a season or two ago, and it works just fine; keeps the mud off my back, which is about all I ever ask of a good fender. Also, about a year ago I replaced the flat alloy Salsa MotoAce bar with the big sweep with a 15mm riser carbon Easton Monkey Lite bar with a less radical sweep that I like a whole lot better. Saved a couple ounces here, too, I guess. Drip-dried, the Pugs now weighs-in at 33.5 pounds. 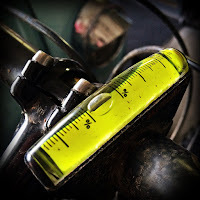 I also added a super-sweet Sky Mounti analog inclinometer to my handlebars, an item which I think should be stock spec on every Pugsley. Anyway, bottom-line: I still love my Pugs and I ride it a lot. It takes a ton of abuse and never seems to complain. It just goes and goes. Almost anywhere, in almost any conditions. I like to tell people, "Some of my bikes might get rode harder, but none of my bikes gets put away wetter than my Pugsley." The opportunity presented itself recently to acquire for a very good price a second Pugsley (and a fourth Surly), a gently used (former rental) Park-Tool-blue model in a size befitting our 11-year-old daughter. Needless to say, I did not turn away from this opportunity, and therefore soon took possession of said bike. We are all quite stoked. Also, our local Nordic Center, from whence my daughter's bike originates, has posted a video on their website which features my friend Ben and I in our first ever fatbike fashion modeling gig. You can watch the whole thing below, or skip to the part where we're riding fatbikes at around about the 2:00 mark. Note our well-rehearsed high-five at 2:20, a thing we'd actually never done before this shoot. We acted it right on the maybe the third take. Was a hoot being followed by a drone as we rode around. And they "paid" us in beer. 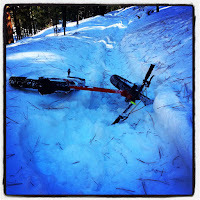 The 2013 (as yours appears to be) Pugsley now comes stock with 120TPI tires. So the previous owner didn't really upgrade them.